This is one of the greatest pizza places on record. My family and I have been eating here for over 30 years! I have so many fond memories, many from a full belly, from this place. In high school, Boardwalk Pizza was a favorite stop after a beach trip, fishing or just about any time. A two slice special and the afternoon or evening couldn’t end much better. When I was feeling like it was a special night, I would grab a cheese steak. The cheese steak is a perfect mix of gooey cheese and tasty steak. Boardwalk uses the perfect roll to place this treat on. One of the few sandwiches that don’t need any condiments. Just throw on the sautéed onions and peppers. My Dad loved to eat in restaurants. His job had him traveling all over the place and he always knew the best places to eat. No matter where we were when I was a kid my Dad knew of some “locals” place. Many are among my favorite places. I was able to convince him to try Boardwalk one night; we ate there almost every Friday night from then on. 30 years later we still grab a pie there, though since my Dad passed away we don’t make it every week. By now I am sure you are wondering what does this have to do with home brewing? Well it helps to be kind to servers and anyone working in the service industry. Over the years I have gotten to know the staff pretty well. One night I asked one of our regular servers if they would save bottles for me. 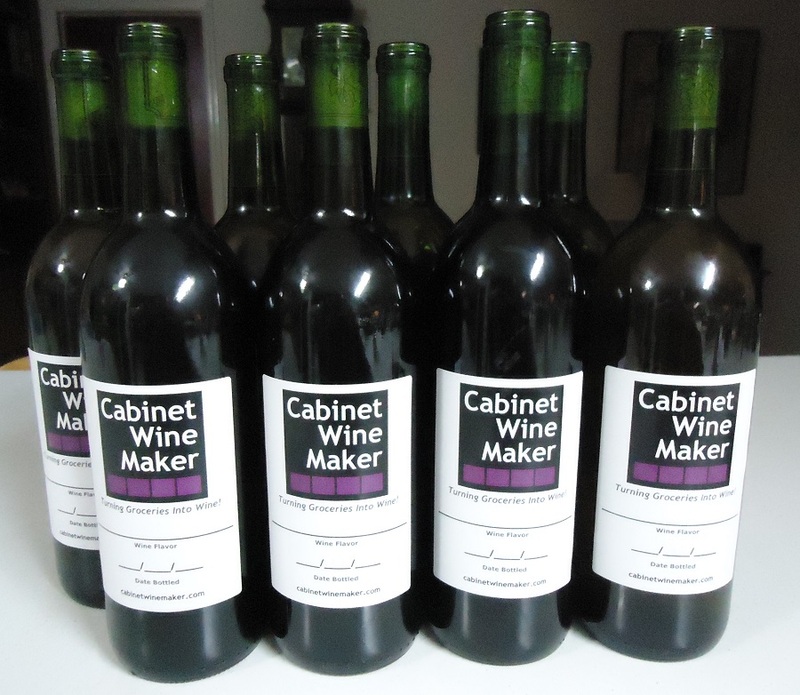 Wine bottles now only cost me elbow grease to remove the labels and sanitize them before use! If you don’t feel comfortable asking at your favorite local haunt, mention your need to friends. I have several who are saving bottles for me now. Remember dark glass that takes a cork. I will share a tip about how to clean and de-label them in a later post. Seriously though, Boardwalk Pizza is a great place with a great menu. They serve amazing pizza but also serve more traditional Italian dishes. Check out the garlic knots and a Caesar salad (the dressing is unreal, we get a side of dressing to dip our crust in). Their staff is very personable and always cheerful; the guys on the line have mad respect…in 30 years I have never had a bad meal. So, I haven’t posted in a quite awhile. My wife and I have been busy! First, I spent some time off work due to an injury and I am still recovering. Then there is the school year and the start of all the extra curricular activities. It’s hard to find time. Though a friend would say if you don’t make the time then it is just not a priority. I agree with that…but only to a point. We have been making some great batches. A few new favorites, some new ideas and a new bottle source. I have seen a new friend close his doors because of a petty enforcement of some vague home brewing laws. 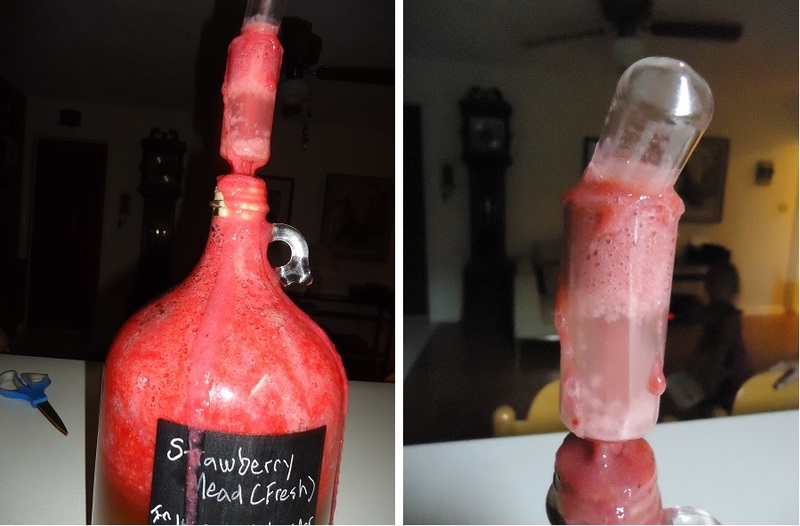 Our strawberry mead was an epic failure. While the batch produced alcohol the taste was horrible. Three gallons down the drain and honey isn’t cheap. I have since learned from reading friends blogs not to leave the fruit in the whole fermentation. Wines that begin with real fruit really need to be done in a two stage method. Not to mention it is best to keep the fruit in some type of bag or cheese cloth so you can easily remove it. To answer the question, don’t stray to far from home! Don’t get me wrong there isn’t anything wrong with other processes or what I would call harder methods. In fact, I have had some great beer and wine from other home brew fanatics. We were a little late getting our holiday gifts going but should be on schedule to bottle 24 750ml bottles. I promise the number wasn’t on purpose and to make it even stranger we will probably be bottling early on the 24th. Our latest batch of house cider was ready to rack. We have been making this cider now for a while and i felt like it was time to experiment. At any rate, I have been reading a great book I bought from a local brew store. The book is “The Alaskan Bootlegger’s Bible”. If you have not heard of it you need to get a copy, the link is to Barnes & Noble but it can also be found on Amazon.com from various vendors. Having my choice I would either buy the book at your local brew store or direct from the author at www.happymountain.net. The book is amazing! Leon W. Kania is my kind of person…down to earth, looking to keep things natural and very knowledgeable. Why am I plugging a book while posting about racking cider? The book inspired me to try a number of things but specifically Kania talks (I say talks because Kania writes as if he is casually talking to you while showing you how to) about using gelatin as a clearing agent. My daughter is vegetarian so we don’t keep gelatin in the house. 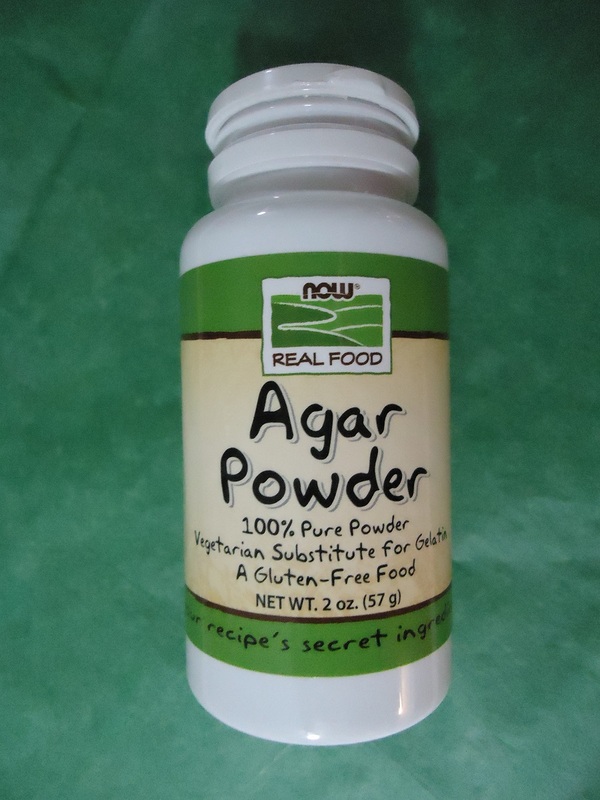 Instead, I have a vegan product on hand called Agar Powder made by Now Real Foods. 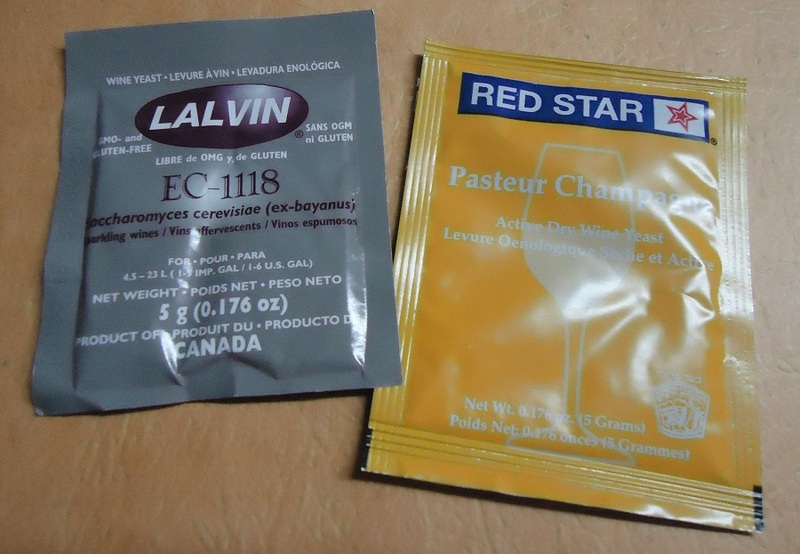 The Agar Powder is made from red algae. The manufacturer claims the final result is the same as gelatin which is made from cattle bones. The product is not only vegan but is also gluten free. We are kinda green in my house. Our yield is three gallons so I measured off 1 1/2 cups of spring water and placed it in a sauce pot on the stove. Once the water came to a simmer I added 1 very large TBSP of the powder, removed it from the heat and stirred. I siphoned off our cider into three one gallon bottles and allowed the algae water to cool. Once the liquid reached a room-temperature state, I put just shy of 1/2 cup into each bottle. The theory is that the gelatin/algae will set up on top of the mixture and begin to slowly descend to the bottom of the bottle. In the process, the gelatin/algae will trap all of the sediment and force it to the bottom as well. Clearing the cider in the process. I am eager to see how this works out and will let you know how it goes in about six weeks. This piece of equipment is highly useful! 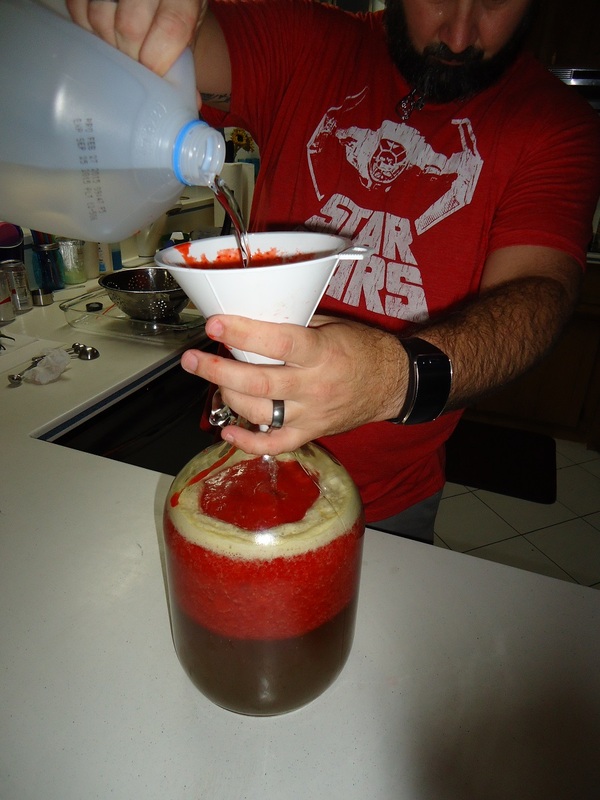 Though it isn’t necessary life is much easier with a carboy dryer. 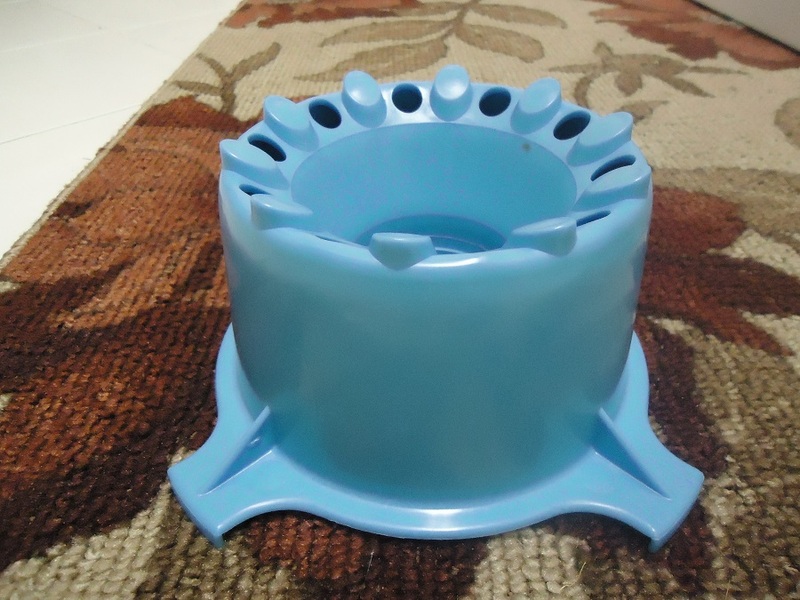 The carboy dryer is made of a high quality food grade plastic. 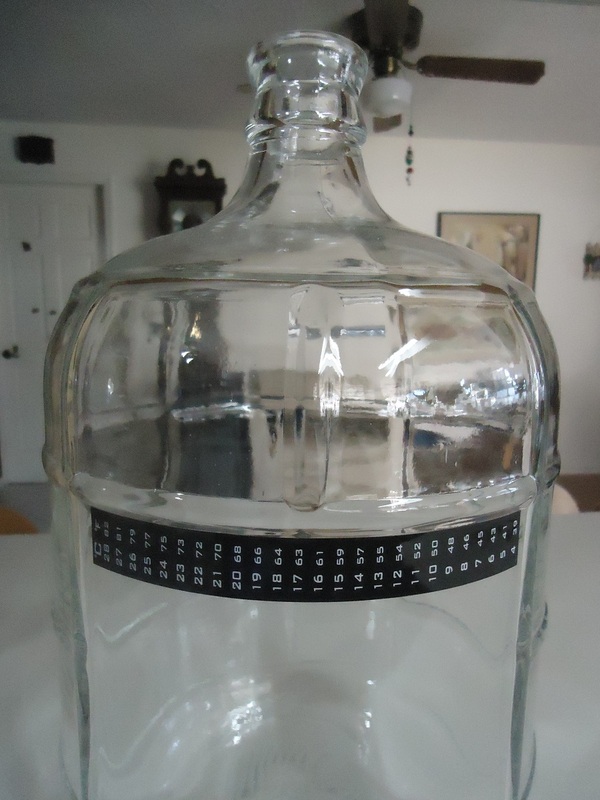 There are strategically placed holes and risers to allow airflow around and inside the carboy. The carboy is washed and sanitized as you normally would and then placed upside down on the dryer to air dry. As I said, the dryer is not necessary but I highly recommend it. 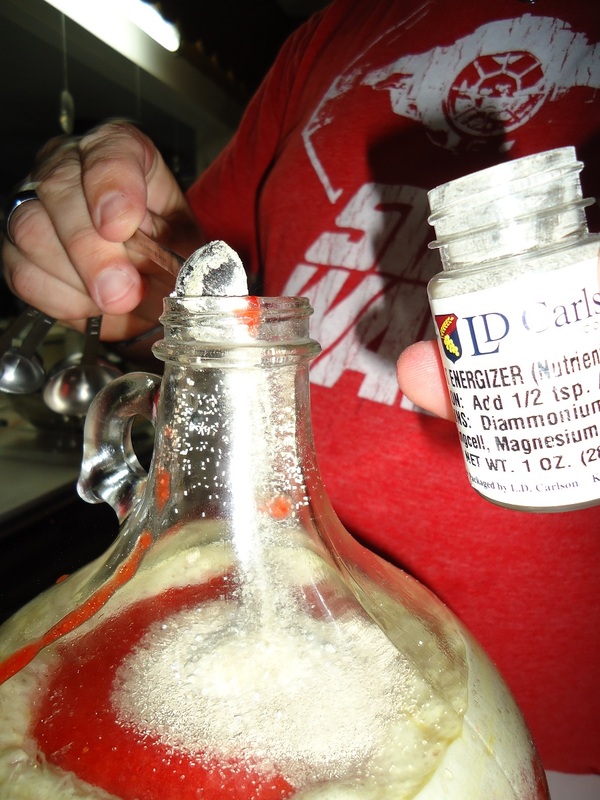 When I first started using carboys, I would clean the container and leave it upside down in the sink until it dried. This works well but takes up a lot of space in the sink. Your sink is useless until the carboy finishes drying. Using the dryer allows you to move the carboy to some other location while drying, a counter, a table or back into the brew closet. I usually put handles on our carboys; I mentioned these in an earlier post. You can review the post here. I leave these handles on the carboy and that can make it difficult to balance on the dryer. This is why I use the dryer in my brew closet; I can lean the carboy in the corner to help stabilize it. My wife is very into organic and local ingredients. She has wanted to try making wine from fresh fruit for some time. In addition, our family believes in local produce and the power of local honey. 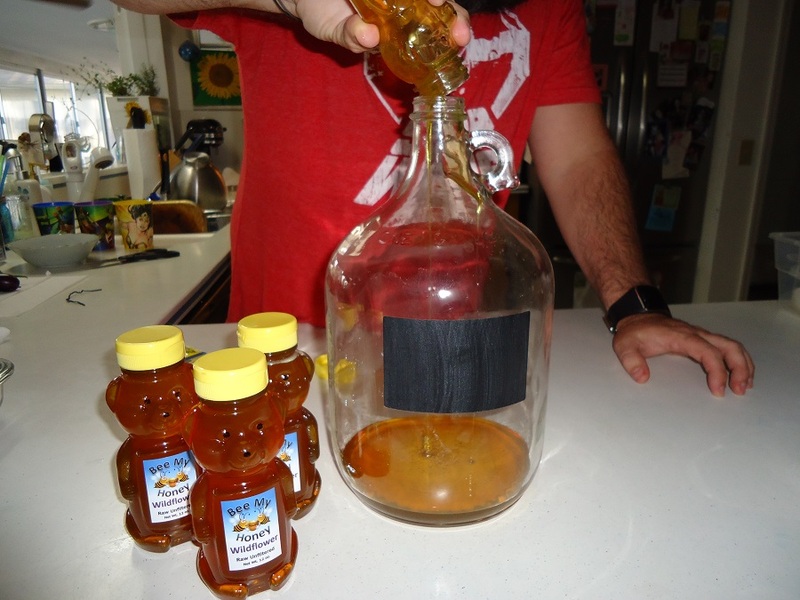 We finally got up the nerve to try making some mead. 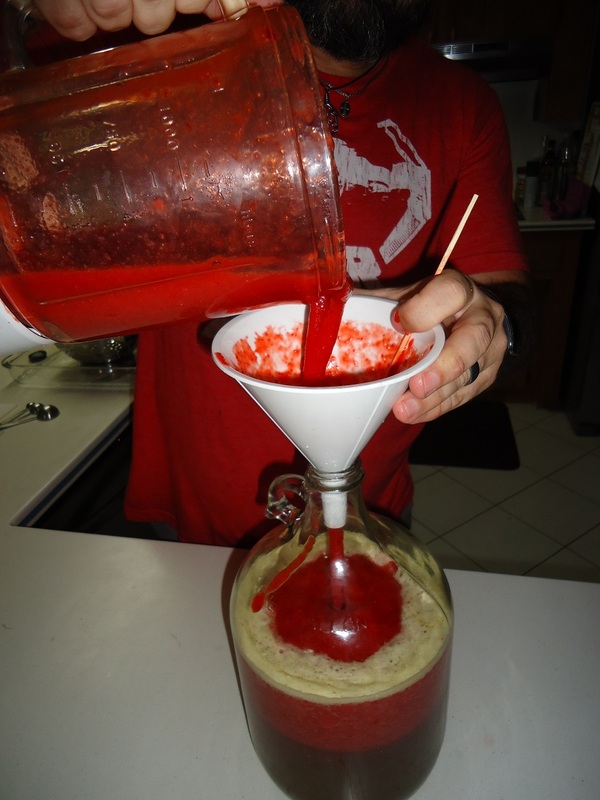 Living in Florida and being in the start of strawberry season we decided to make strawberry mead. The family takes at least a monthly trip to the Good Neighbor Market in Oviedo, FL. Good Neighbor Market is a family owned market with a passion for locally focused products. 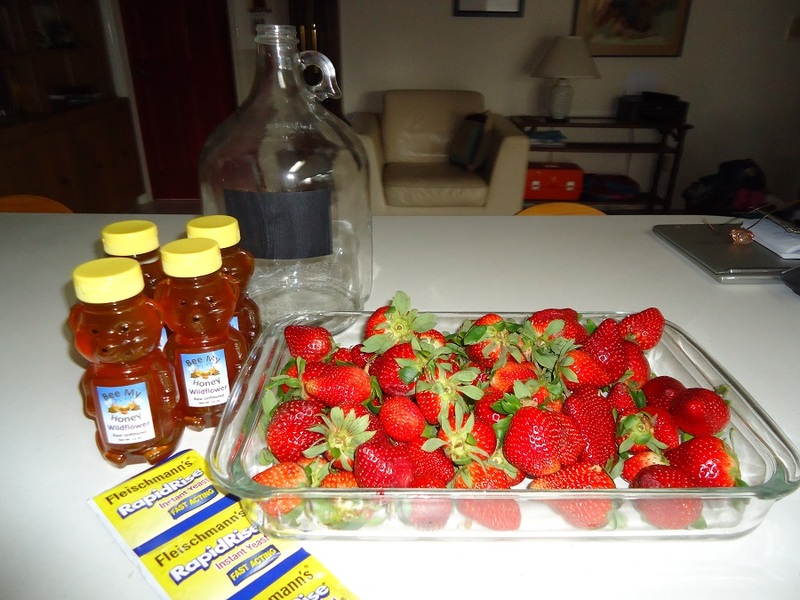 During our visit we scored big with a half flat of fresh strawberries and fresh honey from a favorite purveyor, Be My Honey. We selected a wildflower honey; this was at the recommendation of the bee keeper. According to him the orange blossom would be a little to sweet for mead. With ingredients secured, we gathered our supplies and began our adventure! We first poured the honey into our gallon bottle and mixed a in little of the spring water. We weren’t sure how easily the honey and water would mix to dissolve the honey. Turns out the honey dissolves easier than sugar does. TIP: Honey empties from the container very slowly, if you use a funnel you can poke a small air hole in the bottom of the honey container and allow it to sit upside down for a few minutes so you get every drop of the golden goodness. 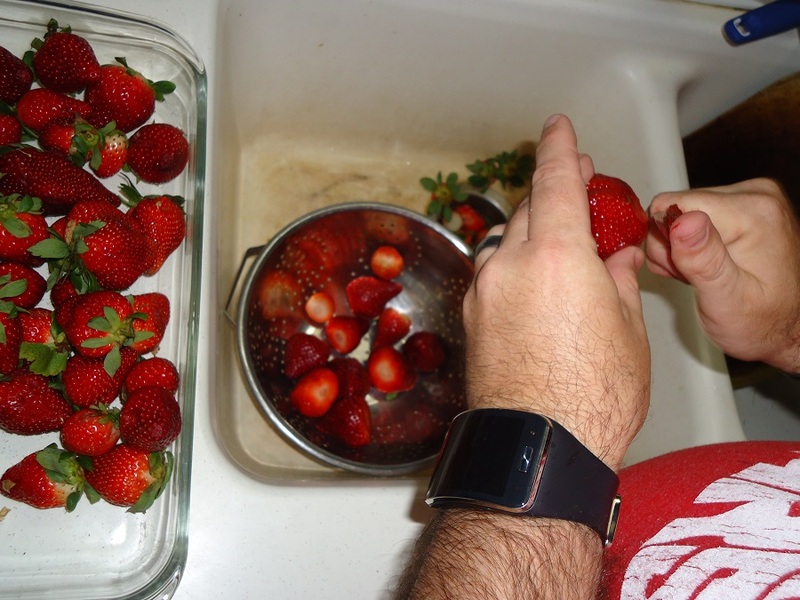 Next we turned our attention to cleaning the strawberries. We used a digital kitchen scale to weigh out about 3.25 lbs. As a side note a pint of strawberries weighs about one pound. The strawberries were washed and the tops were removed. To be honest I didn’t do much research on mead outside of recipes. 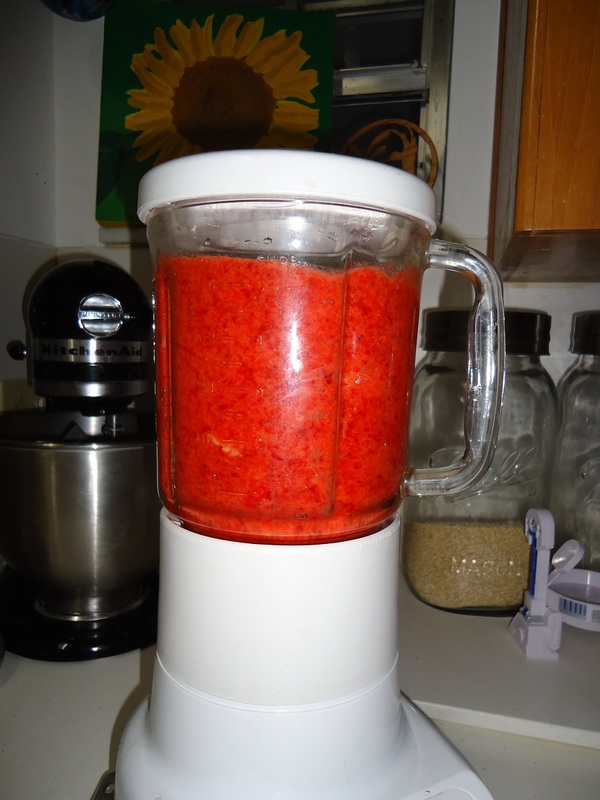 I knew the fruit needed to be liquefied and decided to use a blender to do this. A blender may not have been the best idea (I will share more about this later, sort of the punchline). Had I done more research I would have read a friend’s blog, Wines By Ari. I have been reading Ari’s blog since I started this one. She had a great article where she wrote about using fresh fruit. Ari boiled the fruit in water to extract the juice. Looking back this would have been a better solution. Though as Ari knows, I try not to use heat…probably because I am stubborn. 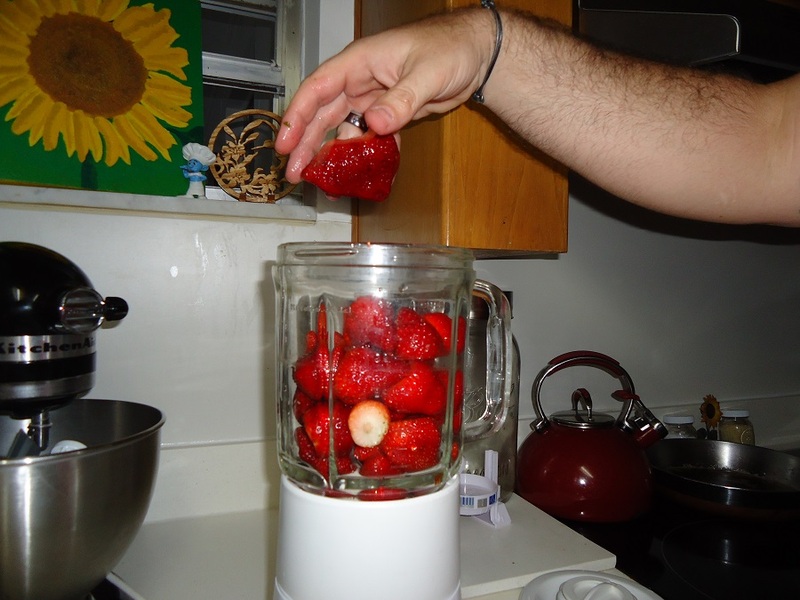 We blended the strawberries in two batches and blended until the fruit was as liquid as the blender could handle. We then added the strawberry “juice” to our gallon bottle using a funnel. The mixture was still a little thick and I used a skewer to coax the liquid down the spout. 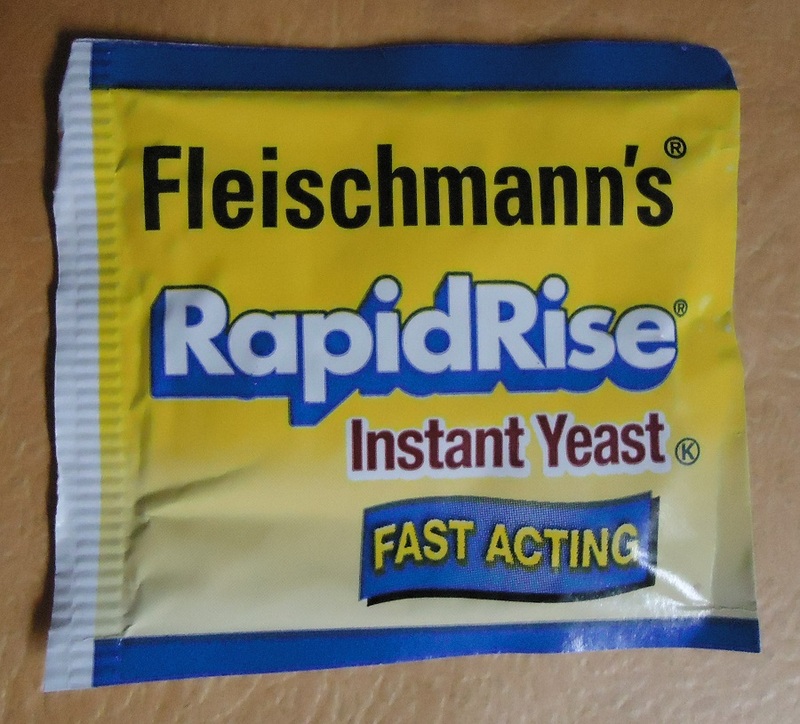 We then added our packet of yeast and topped off the bottle with spring water. I was extra careful to fill only to the one gallon fill mark. Finally, we added a tsp of yeast nutrient. We usually only use 1/2 tsp but with uncertainty we felt a little more couldn’t hurt! Here we used the LD Carlson brand however I am not sold on a particular brand but I feel it is important to add. Adding yeast nutrient seems to insure the yeast lives long enough to reach its highest potential ABV (Alcohol By Volume). Lastly, we placed the cork and airlock in the neck and placed the batch on the counter to monitor for the night. We completed our first batch of mead! I rushed into the kitchen and found that the batch had blown through the airlock and was seeping onto the counter. I spent the rest of the night cleaning and re locking the bottle. It was a mess. Finally the batch quit blowing through, I topped the bottle off with more spring water and locked it a final time. The batch still smells strongly like wine fermenting so it is now in the closet doing its thing. I continue to monitor it and be optimistic that we will have a great batch of mead. Next time I will at least review Ari’s post and concede to a little heat! I will let you know how it comes out when we rack it. I am a little behind on my wine log. Things have been busy and I had back surgery this week. I am finally feeling a little better and with activity restrictions I have time to catch up. Almost two week ago my wife and I bottled some of our Lite Cider. We are now calling it our House Cider and believe we have perfected the recipe for now. Feeling accomplished we decided to do some experimenting and started three small batches; strawberry mead, a new cranberry and some passion fruit. 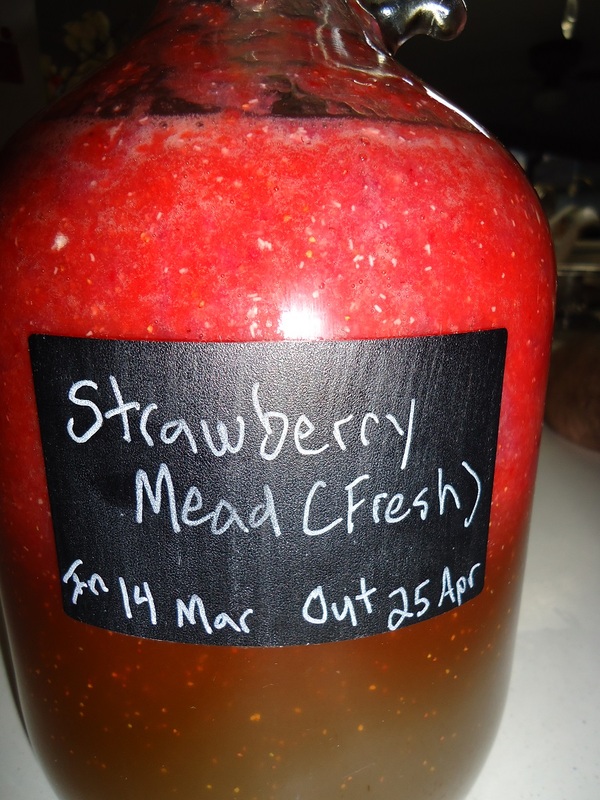 I will write about the strawberry mead in another post and share some revelations about it. 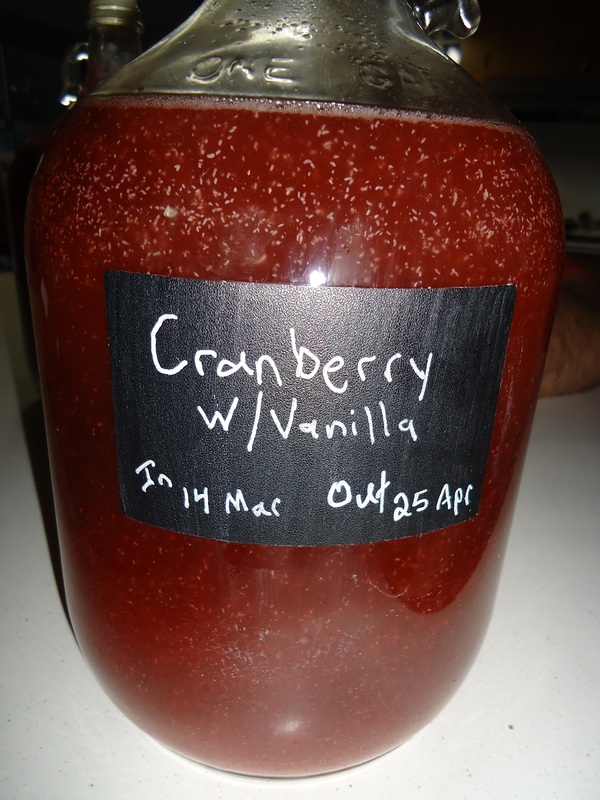 For the cranberry, we usually use a combination of brown sugar and white sugar. 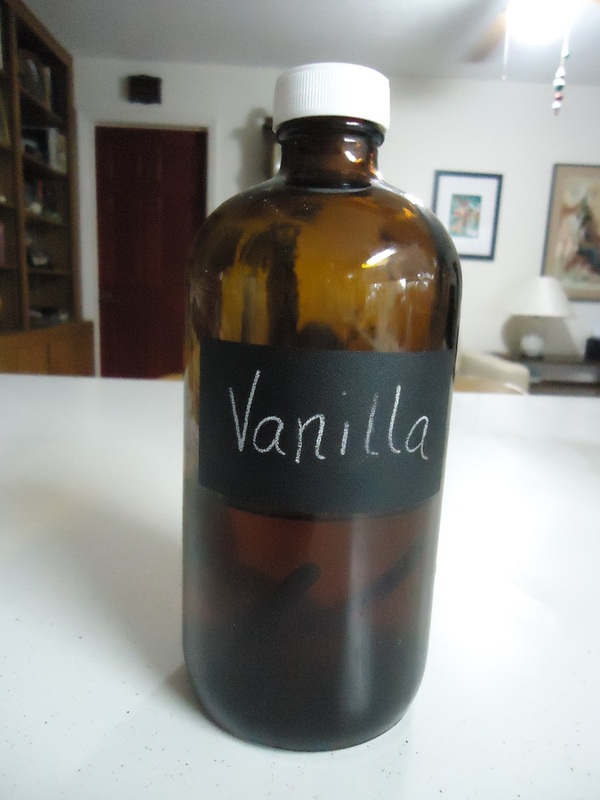 We wanted to try adding some homemade vanilla to the batch for some added flavor. When we pulled ingredients together i found we were out of brown sugar and i was feeling lazy so we added the vanilla but left out the brown sugar. I will need to do another batch of this with the brown sugar and compare the final taste. Who knows maybe we will end up dropping the brown sugar; it is kind of a pain to get into the container but the wine has been tasty. When we first started making wine we did a lot of different flavors. Lately we have been focused on perfecting the apple cider and cranberry flavors and something has been missing. While I really enjoy the cider and feel like we have nailed a regular recipe my more adventurous side has missed the multiple experimental flavors. I love citrus flavors and passion fruit is no exception. 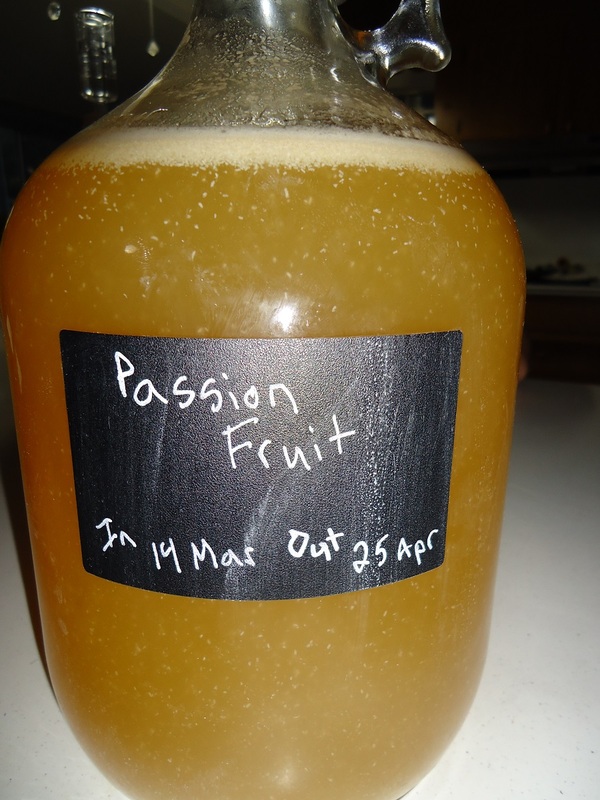 I must admit though I am a little worried about passion fruit. I have read several times to avoid citrus flavors with the method we use. That being said we have successfully done strawberry, kiwi and other blends of citrus fruits. With my wife’s encouragement we decided to go for it. After mixing the two batches we left them on the counter over night to observe the beginning of fermentation. Both batches began bubbling hard and smelled like fermenting wine. I have since moved them to the brew closet and continue to monitor them. I am excited to rack them and have the first tastes. Eagerly awaiting the 25th of April when they should be ready! 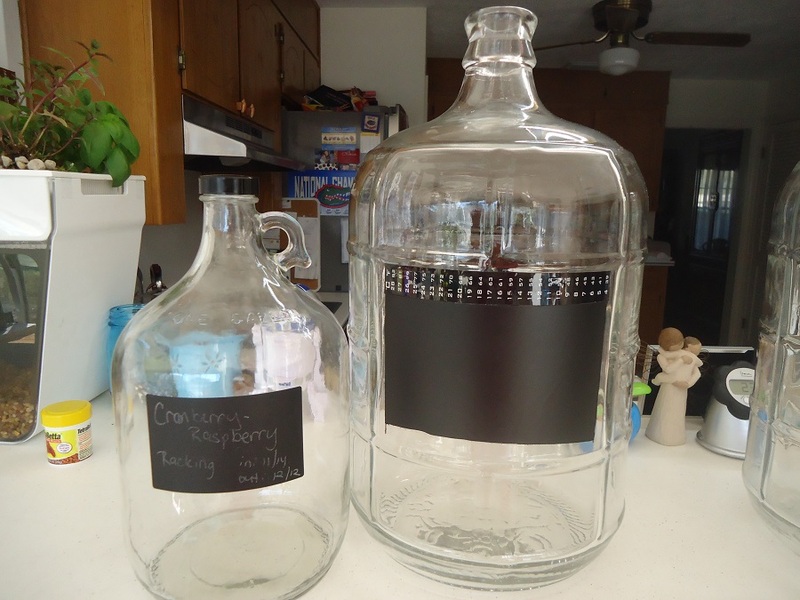 Our wine making became more of a hobby when we bought our first carboy. Since then we have tinkered with how we like to set them up, we first started putting chalk stickers on them and later we found some thermometer stickers. My wife and I are sort of a freaks about organization and tracking information. We like to mark our bottles with flavor, date started and date it should move on to the next step. This is how we do it now. I love these thermometer stickers! We put them on carboys and bottles. I even have one on the inside of one of the house windows to monitor the outside temperature. It is important to monitor the temperature of your wine during fermentation and racking. I place the thermometer sticker sideways on the carboy because it fits better on the carboy I use…you can put it where you like. I just find putting it with the label makes it easy to see. 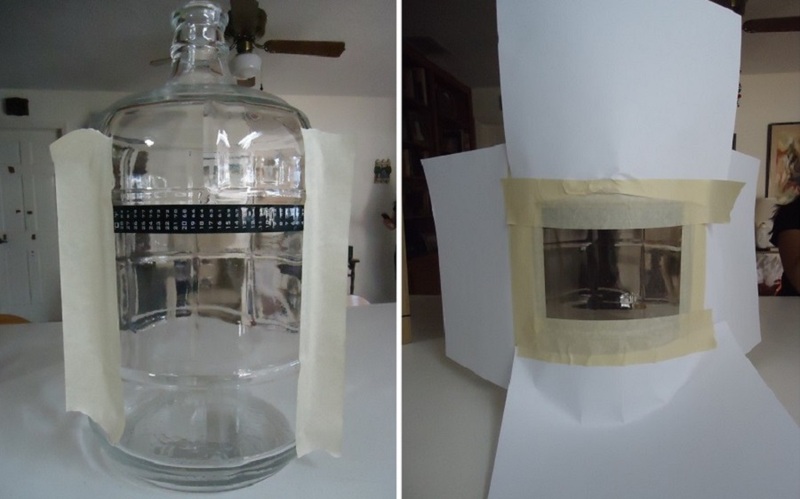 Next, I use the masking tape and computer paper to protect the carboy during spaying. I like to try and keep the edges as straight as possible and evenly spaced. That is OCD talking. TIP: Using the wide masking tape makes it easier to tape to the carboy while leaving room for the paper. I usually secure only one side of the tape, put the paper on and then make sure the tape is secure on the paint side. 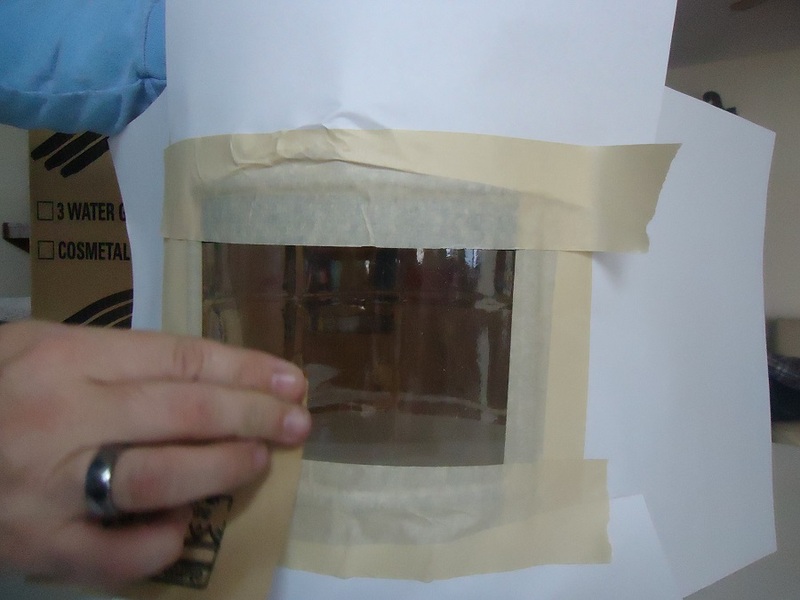 After securing the tape, you will want to lightly sand the glass where you are going to paint it. This helps the paint stick. I used emery paper. Emery paper is a special type of sand paper for glass. Sand paper will work, I only have the emery stuff because I have a glass bottle cutter it came with. 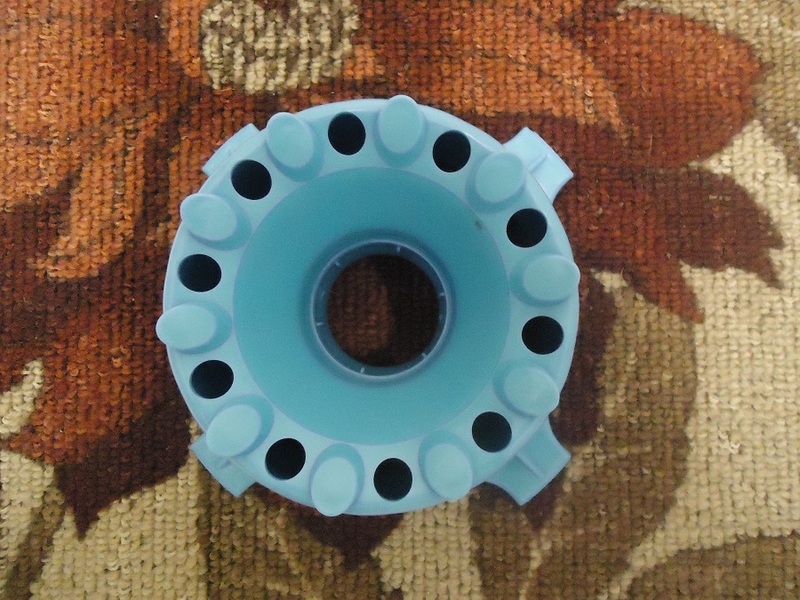 We use the bottle cutter to make candles (a topic for another day!). Be careful to rub the paper in small circles and try not to “sand” the masking tape. Once you are satisfied with this, it is time to paint! Patience is a virtue at this point. 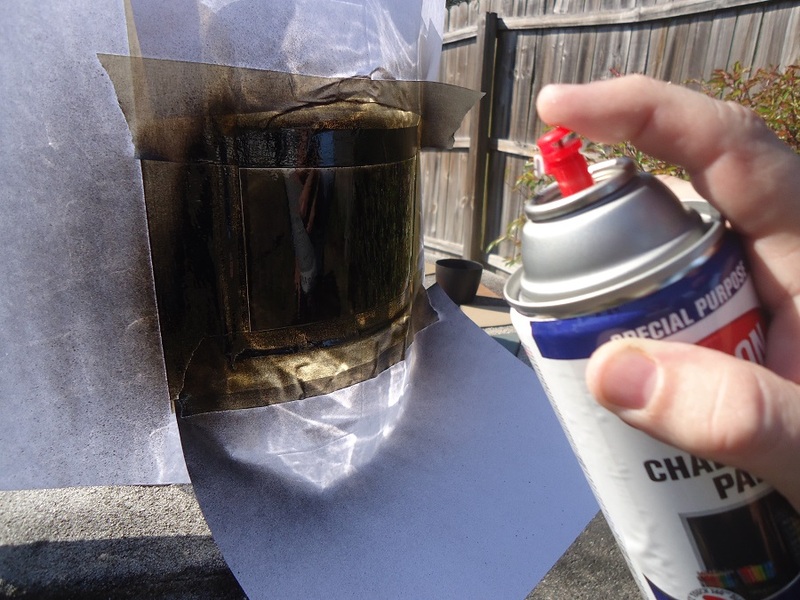 Take your time and put several light coats on and follow the directions on the can. 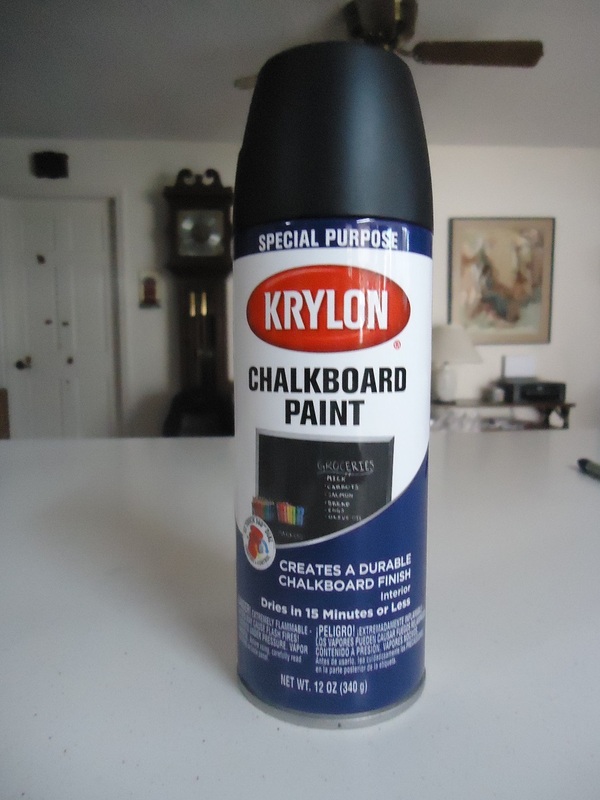 I used Krylon and their instructions state you have to put two coats on to get a good chalkboard surface. Each coat can be applied in 15 minute increments (I put on four to five coats at minimum). The paint is dry in the first three hours but needs at least 24 hours to cure before applying any chalk. It is also recommended to do this outdoors. After waiting three hours you can remove the paper and masking tape. 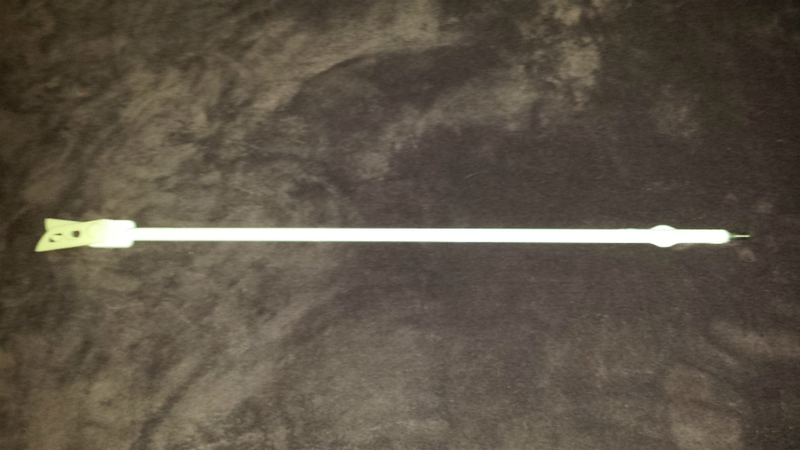 I like to lightly score the line between the tape and paint with an exacto blade to help keep the edge clean. If you have some over spray or paint spots outside your line, you can carefully scrape it off with a razor blade. After 24 hours your carboy is ready for a batch! Now you can stay organized and write on the surface to keep track of flavors and batches. TIP: The chalkboard paint surface will work best if you prepare the surface before using it. To do this color the entire surface with chalk and wipe clean with a damp rag. You can use this trick for any chalkboard paint project. Hard cider has become my favorite wine to brew. This beverage blurs the lines between wine and beer. Hard cider has become a popular drink both on beer shelves and in bars and pubs. Many bars, restaurants and pubs sell hard cider on draft. On beer shelves in liquor stores, grocery aisles and other shops hard cider comes in several varieties. We started with apple wine and while it was good, it just didn’t have enough apple flavor for me. I wanted a big apple punch in flavor. After going back and forth and my wife and I doing some online research we found an amazing product. 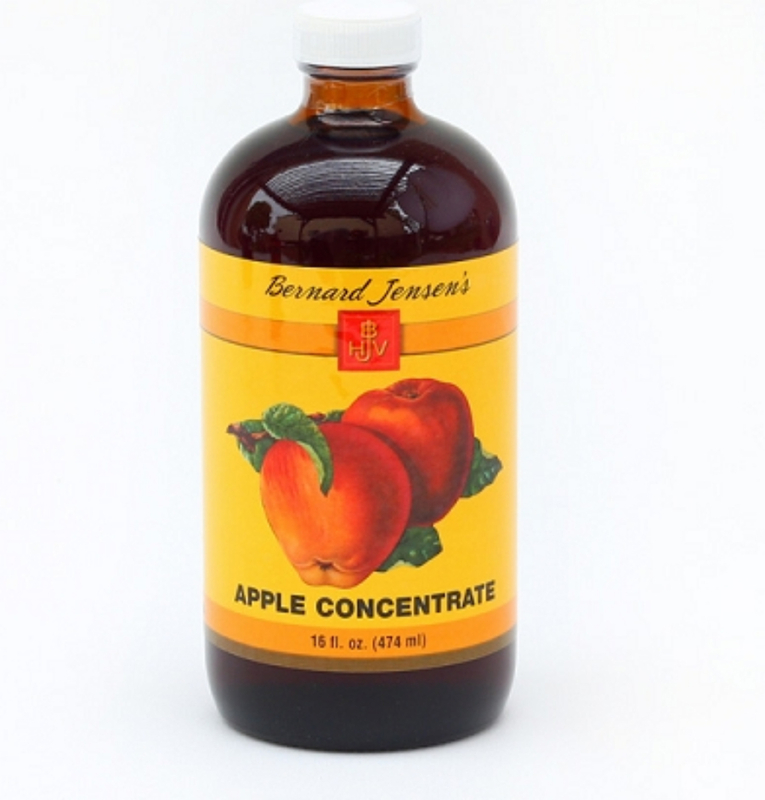 I have mentioned this stuff before, Bernard Jensen’s 100% Apple Concentrate. Since we have been making this for a while, I think we have the recipe nailed. However some of the drier wine people who have had it think the hard cider is to sweet. We decided to try a “lite” version. We also changed the sugar we use to Zulka’s Morena Pure Cane Sugar. Morena is an all natural product and reflects our hippie tendencies. The sugar is 100% organic and a non-gmo product. The sugar has a slightly tan color. We like it in coffee and may switch to this sugar for all our household needs. We made a three gallon recipe! I mixed the ingredients following the basic process (found here). However, we now mix most of the water and sugar before adding any juice concentrate. After adding all the ingredients we secured the airlock and left the carboy on the counter over night to “watch the science happen!” In the morning, I put the batch in our wine closet. The batch will be ready for racking on 15 Feb 15. Another six weeks and we will be bottling the Hard Cider Lite…I will update this post then and let you know how it turned out.